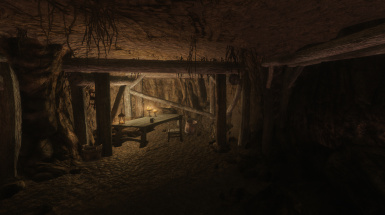 Cidhna Mine, Skyrim's most notorious prison and the source of Markarth's vast wealth, finally lives up to its reputation with this MASSIVE expansion. New places, new people, new challenges! Talk to me if you want to make plugins or patches or the like. Translations would be OK but let me know so I can link it. This was all made by me using base game assets. Deluxe version requires Apachii SkyHair; assets not included. Brutish Argonian head mesh created by VectorPlexus. Added a new secret area with some extra loot! Both followers can now dual-wield! 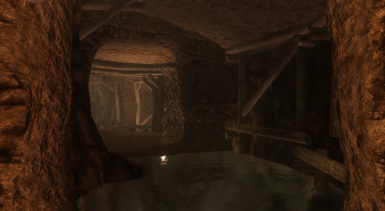 Greatly reduced number of empty skooma bottles in the "dump" for better performance. Added a dangerous NEW secret area for brave explorers! Various minor changes, fixes & tweaks. 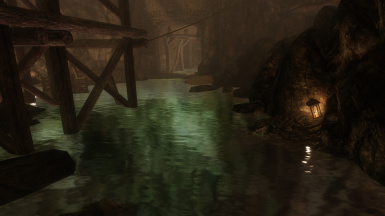 "Empty Skooma Bottle" item now has its own unique mesh, made to float on water. 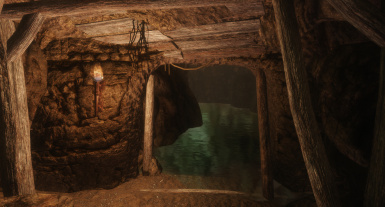 Added a few more provisions to the mine, for compatibility with "needs" mods. "Think that's water in the river? Blood and silver are what flows through Markarth, friend." 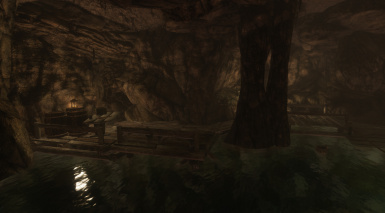 Playable area over four times its previous size! Twenty new unique characters, including two followers! Extreme lighting overhaul and new sounds! 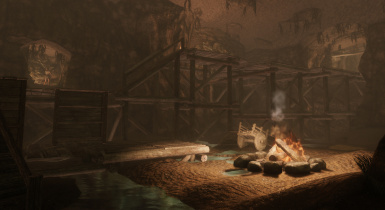 New places to explore and strange new details to discover! New challenges seamlessly integrated into original quests! 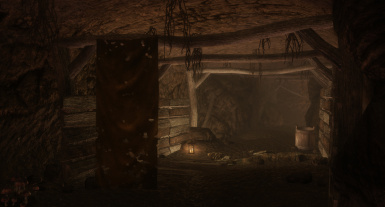 "No One Escapes Cidhna Mine" was always, in my opinion, one of the most interesting quests in Skyrim, but I can't be alone in feeling underwhelmed by the location itself. 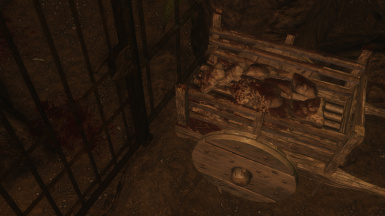 A couple of little rooms with a handful of prisoners? I wanted to do better. With this expansion, the mine is a dark, twisting maze that winds deep into the earth. When you are sent to talk to a specific prisoner, you will have to do some exploring! Some of its passages are lit only by torches on the ground. You can pick them up to light your way... but if they burn out it leaves the place that much darker! Along the way, you will meet a colorful variety of new characters. Most are fiercely loyal to the King in Rags, but two would be willing to join you in your escape. Which two? The only way to find out is to ask! 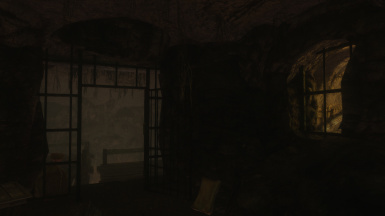 Each new prisoner has a brief bit of dialogue in which you ask for their help. The ones who say yes will then give you the standard "follow me" dialogue. If you choose to fight your way out, you will face great opposition. You may need these new allies to keep you alive. If you side with Madanach, prepare to watch his formidable new army lay waste to their oppressors! That file is my preferred version of the mod. 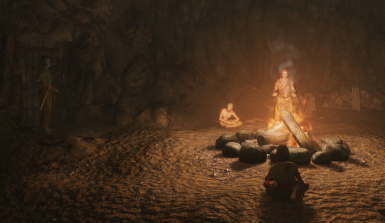 It makes use of a few Dawnguard assets and uses carefully-selected hairstyles from Apachii to make most of the new NPC's look more unique and more grizzled. Don't worry that they will look too glamorous. I wanted most of them to have wild overgrown long hair as if they hadn't seen a barber in a long time. Vanilla hair isn't great for that. I am also offering a stripped-down version that uses nothing but vanilla assets, for people who don't have one or the other of those. If you ONLY have Dawnguard or you ONLY have Apachii Sky Hair, just grab the basic one, it's fine. These are not big enough differences to make more versions worthwhile! DO NOT load a previous saved game inside Cidhna Mine after you install this. It will be all kinds of broken, trust me! 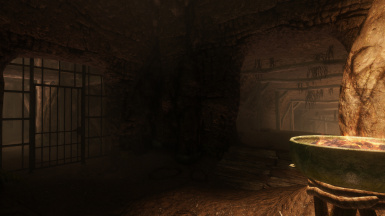 For best results, play the Markarth questline from the start. 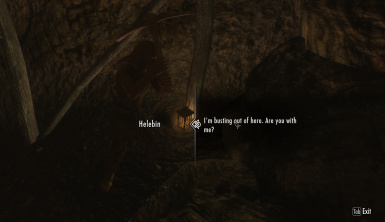 It is possible to get thrown into Cidhna Mine for your average everyday crimes rather than as a part of the Markarth quests. That's not going to be as cool. New dialogue and such is triggered by the full quest. Clear your bounties before you go to Markarth. Not a beta! This mod has been exhaustively tested and polished. 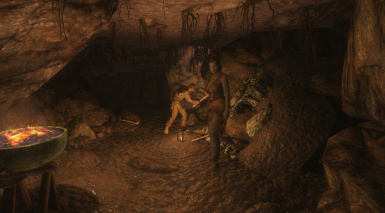 I've played through the quests in Cidhna Mine dozens of times to make sure everything I've added works perfectly! Better than perfectly! It's all meticulously navmeshed and optimized and debugged and cleaned. It's everything you could want in a mod! There aren't a lot of mods that mess with Cidhna Mine, but obviously you don't want to run another one next to this one. There could be some conflicts with lighting overhauls, so load this after those. 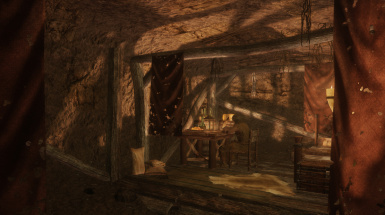 If you are an experienced modder, I recommend using TES5edit to strip out references to Cidhna from your lighting mods. They're in block 7, sub-block 2 and block 8, sub-block 4. I also made some minor tweaks in Druadach Redoubt which is block 5, sub-block 5. If you don't know what the F I'm talking about right here you can safely ignore it. 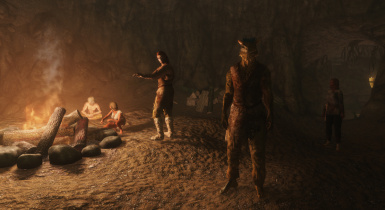 Vanilla NPC's are untouched aside from a couple of them being moved around. Aesthetic overhauls for their hair and faces will have zero conflicts with this. I didn't change the original quests, just worked around them! It's probably going to be more fun if you side with Madanach! 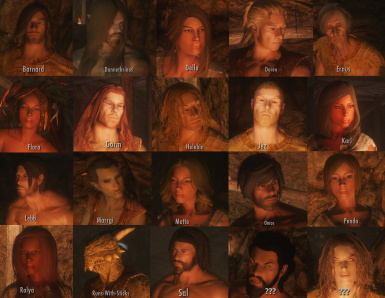 As it is in the vanilla game: If you choose to join Madanach, it's best to wait until midnight or so before joining the Forsworn rampage through Markarth. Otherwise they might get in tangles with essential NPC's wandering about town, and the battle scene can get stuck in a loop. I widened some of the escape tunnels, but it can still be hairy with 20 NPC's trying to run through. Don't freak out if they seem to be stuck. Give 'em a minute, they'll get there just fine! You will need to poke around in the dark a bit to find the two followers. They are set apart from the others. They are each visually distinct in their own ways from the common rabble. One is human. There are a few new ways to get a shiv. 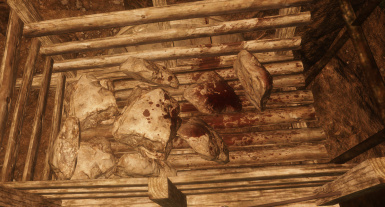 There are also some pretty decent weapons hidden... somewhere. Very well hidden. 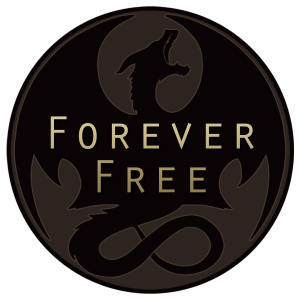 Thinking about a fresh playthrough? Remember that mage characters have a serious advantage when prison guards take away their gear! The crazies in the cage can be a bit of a problem. You can fight each other through the bars. Try not to lead your followers near them with the door locked or it could turn into an insult contest that never ends. It's possible to let them out with Borkul's key, or a lockpick, but it's probably a bad idea! 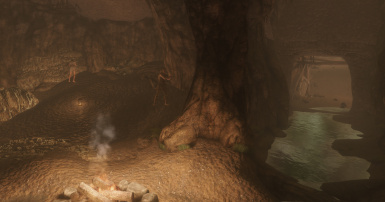 The two followers will chill in Karthwasten if you dismiss them after you escape. The rest of the new characters will follow Madanach to Druadach Redoubt, which I fixed up a little for their benefit. People underestimate Flora at their peril.